JERUSALEM (JTA) — Masked Palestinians attacked police at the Temple Mount with stones and firebombs for the second morning in a row. Israeli security forces who came to quell the rioting on Tuesday at the Mughrabi Gate pushed the protesters back into the Al-Aksa Mosque at the site. Twelve protesters were arrested and several police officers were injured in the clash. The incident occurred on the fast day of Tisha b’Av with thousands of Jewish worshippers gathered below the Temple Mount at the Western Wall for special prayers. The day of mourning marks the destruction of the First and Second Temples in Jerusalem. The Temple Mount was open to visitors after the incident. 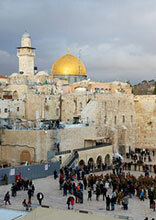 Extra security measures were put in place in Jerusalem’s Old City for the fast day, according to police.